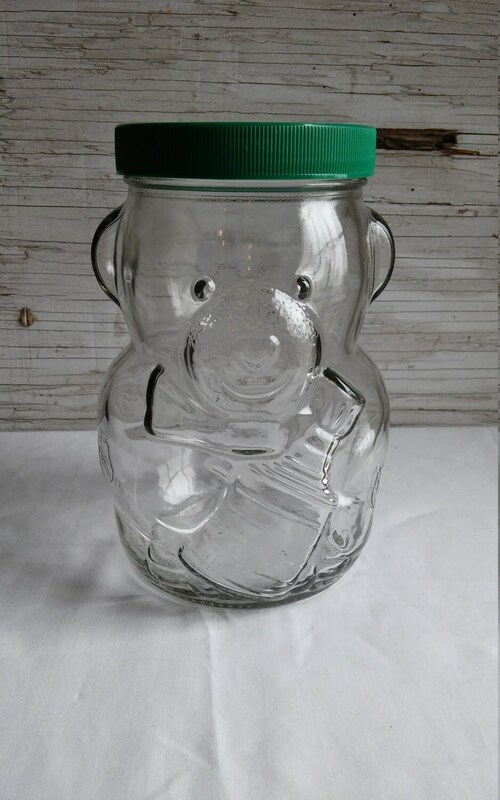 Vintage 1988-1990 NHL Hard-to-Find Kraft Peanut Butter Bear Glass Bank with a Green Slotted Lid. Very Collectible and it has an ERROR. Vintage 1988-1990 Kraft Peanut butter bank representing the National Hockey League. I have two of these banks and both are available for sale. Both banks have the letters NHL in 3 places. There are two on the bear itself and also on the bottom of the jar. However, if you look closely at the letters on the right side of the bear, the letters read LNH and not NHL. This is an error and for anyone that collects anything, errors make the collectible more valuable. Both banks in my possession have this error. Maybe, all were manufactured having this error. I'm asking $25.00 for each bank and this price includes free shipping in the USA. Vintage 1950s Pirates Treasure Chest Amber Glass Bank. Great Childs Gift. Encourage Saving. Learn the Value of Money. Free USA Shipping. Vintage 1986 set of 3 Stoneware Kitchen Pieces. Includes jam jar with lid, butter dish with lid and utensil holder. All artist signed. 1960s Tiny Mite Bank Safe. 3 Tumblers to Undo Safe. Manufacturered by Arrow Specialties Los Angeles 15 Cal. Great Cond. Free Shipping USA. Vintage 5" Long x 4" Tall Cast Iron Pony Bank. Intact. Gold Paint over black. Coin Bank. Rearing-Up. Intact. Not the original screw. Vintage Liberty Bell Piggy Bank. 200 year commemoration. 1776-1976. Historic. Carnival Glass Color. Encourage Savings. A Great gift idea. Vintage 1960s Wenden-Crafts New York. Pressed Pulp. Rare Piggy Bank. Nicely Used Condition. 6" L, 3" W, 4" H. Great Collectible. V Nice. Vintage 1991 Die Cast Metal Bank. Part no. 171500. Air Eastwood Fast Delivery Bank. Excellent condition. Free USA Shipping. Great Gift. Vintage 1992 Ertl Die Cast Coin Bank. The Bank is a Replica 1941 Ford Truck Delivering Seasons Greetings. This Coin bank has the key.No box.